Play Sky Kid online with Nintendo NES browser emulation for free! 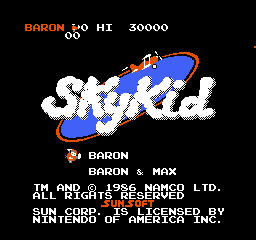 Sky Kid (NES) game rom is loaded with features in our flash, java and rgr plugin emulators. Nothing to configure, we've done it for you! I've never gotten this far! It's very hard to beat level 2. Even though this is from an older arcade game, I still like the graphics and think that they are pretty good for their time, they are pretty standard and there is really nothing super special about them, they are pretty basic and simple but I still like them because they are nice and colorful. I scored the graphics of this game a 7 because they are not really super high definition because it is an older game, but I still think they are nice enough to keep the game fun. 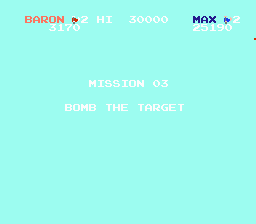 I think the sound of this game is pretty catchy when you are trying to fly and eliminate the ships in the air and collect the bomb and drop it on the enemy target base area. I like it because it gets me into a gaming mood when there is sound in the game, it makes it more fun to play and also more enjoyable overall, so I think that good sound is a big bonus when you are playing a game. It provides a background of sound versus having a dull quiet game with no sound which can get pretty boring really fast. So I scored the sound of this game an 8 because even though it is simple it is better than nothing and it does go along with the game and makes it more fun to play and enjoy. Even though it is not quite as addicting as games like pac man or dig dug or any of those, it is still an addicting game because it is simple and fun to play. The objective of the game can really determine if it is going to be fun or not, in this case it is an arcade game and the gameplay is meant to be kept simple in quality but very fun and addicting to play. 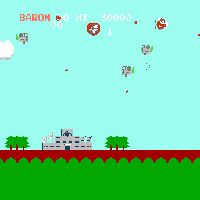 The game itself is simple, you play as either red baron or blue max depending on if there are 2 players in the game, and the task is to fly in the planes and eliminate specific targets ,the mission and they can be destroyed by dropping a bomb on them which is in the middle of the game and you pick it up. 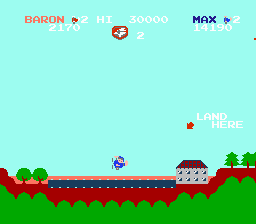 The x button in this game lets you fire at the planes and the z button lets you do loops or help you fly back up when you have been shot out of the sky. The game takes place during WWI so you will either have to bomb enemy bases or a ship in the middle of the water by dropping a bomb on them. The game is really simple and easy to play which makes it addicting. I scored it a 6 because it is a little bit more complicated because some levels are longer than others, but overall the task at hand stays the same. As I have said before, this game doesn't really come with much of a storyline other than you are in WWI and your mission is to eliminate enemy targets by dropping a bomb on them which can be found later on in the game. It may be a little bit more complicated than other arcade games because the targets may change, levels might be longer than others or the bomb may be in different location making it a little bit more complex than other simpler arcade games. But other than that this game and most other arcade games don't give a detailed drawn out story about it because that could make the game harder to understand or more boring and less fun to enjoy so I scored it a 4 because it doesn't really have one except when it takes place at. 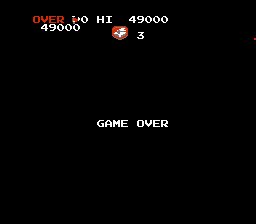 The game is a little harder than some of the arcade games I will admit because the sky can get crowded with so many planes that will occasionally flip and then you spiral drown and hit other planes making it potentially harder to recover afterwards. 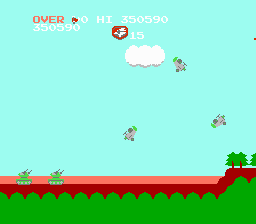 Plus it can be difficult to duck down and avoid being shot at by some of the missile shooters that fire high into the sky or try to get the bomb to eliminate the target, it can be very challenging at some times making it harder than other games. Compared to other games like pac man for example, the levels can be kind of long and hard to beat once you get deeper into the game. Like there will be more planes in the sky, the ground will be higher with buildings making it hard to maneuver and avoid crashing into things. But overall I scored the depth a 6 because some levels can be different in length and the target you have to bomb changes so it is more difficult and it can last a long time. Like I said, the game can be more difficult than some of the other arcade games out there mostly because the game's levels are longer, the target you have to bomb can change, the sky will be filled up with more enemy planes and there will be more cannons firing at you making it more difficult and therefore makes the game more challenging than a game of pac man for example. 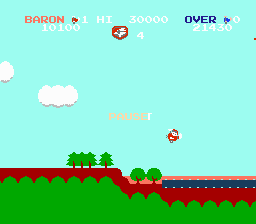 I think most of the game's actual difficulty comes more from the actual gameplay itself over the controls of the game, there are 3 main functions, you move or control your direction with the arrow keys, you can shoot with the x button and you do loops with the z button which is also used to help you recover from falling out of the sky and potentially save you from crashing altogether. So the gameplay itself is more difficult than the controls used, which is why I scored the game a 6 in difficulty most of which comes from how hard it can get to complete the objective in the later levels of the game. Overall I really liked this game and I enjoyed playing it despite the fact that it is a little harder than some of the other classic arcade games out there, but nevertheless I think it is a fun game to play and I enjoy playing these arcade games because of their simplicity and addictiveness. I liked writing a review for this game and I score it a 9 overall because it is a classic and it is a very addicting, challenging and also fun game to play which is why I liked playing it. 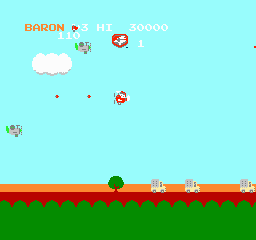 You are the legendary Red Baron, flying a plane through a horizontal side-scrolling scenery set during World War I. To complete a mission, you simply need to get to the landing spot on the other side without being shot down, but you can gain extra points by destroying enemy vehicles and planes. For huge points, pick up a bomb hidden in the level (you will be warned by a sound when approaching it) and drop it on a large structure. If you fail to land on the landing strip, you run out of fuel and crash.You can only shoot horizontally and diagonally by tilting the plane's nose. When in trouble, perform an aerial loop with the secondary button, this often destroys other planes and avoids bullets. There is a co-op mode with the character Max as well. I highly doubt this is the easiest game you have ever played.